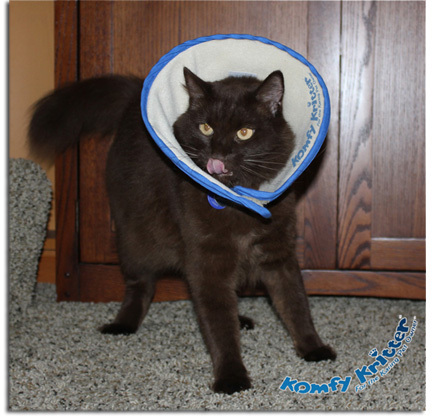 With the solid plastic internal construction, the KOMFY Kritter™ protects against licking, biting and scratching. Soft e-collars invite your pet to easily crush the collar against the floor or wall, so your pet can do anything it pleases - that includes ripping out stitches, scratching hot spots and biting itself raw. A crushed soft collar just means another trip to the vet, more money, and more pain for your pets. KOMFY Kritter’s sturdy internal construction maintains its round shape so your kritter’s head and face rests easily against the plush fabric like a pillow. Giving your kritter time to sleep longer and more comfortably aids the healing process. Soft e-collars are not as durable as the KOMFY Kritter™ because soft e-collars lose their shape right out of the package. Misshapen collars can cause agitation - unsecured plastic strips can poke your pet’s chin, head, and neck. Sagging nylon can even hang in front of your pet's eyes and obscure its vision, which can lead to even further injury. KOMFY Kritter™ is easy to keep clean, so you can use it over a longer period of time. When it gets dirty, simply remove the solid plastic insert and toss the KOMFY Kritter™ in your washer and dryer. Soft e-collars, on the other hand, aren't machine-washable, so tossing them in will only damage them and make them even floppier. Not being able to wash them is just more hassle, because soft e-collars tend to get sticky, and the foam absorbs odors like a sponge. Even if you hand-wipe your soft collar daily, it doesn't guarantee odors won't stay. KOMFY Kritter’s plush-yet-durable fabric is not only washable, but also breathable! Soft e-collars trap heat and prevent proper ventilation, which leads to a hot, agitated pet. With the KOMFY Kritter™, heat dissipates easily and keeps your kritter cool and comfortable. KOMFY Kritter™ stays affixed to your kritter's collar with two overlapping methods - first, the pet's collar is attached by six durable fabric loops. Then, strong Velcro keeps the Kritter closed, and in its proper shape. This added security protects your pet's healing injuries and hot spots from self-inflicted irritation, a level of protection no soft e-collar can offer. KOMFY Kritter™ has binding on the inner and outer edges, which is designed to protect your kritter’s neck. It's just as useful in keeping your shins, walls, and furniture from being scraped as well! KOMFY Kritter™ is made in the USA unlike soft e-collars which are made in China and have a strong chemical odor, which is difficult if not impossible to eliminate.